This is an introduction to the works of Plato. Plato is regarded by many to be one of the West’s greatest ancient philosophers. The student of Socrates and teacher of Aristotle, he wrote many books in his life time and here you will find a brief summary of his works. To find the actual books themselves, look at our sister project Wikisource. Plato was born into an Athenian aristocratic family around 427/428 BC. His father Ariston was said to be an ancestor of the last king of Athens, Crodus and his mother Perictione was a relation of the Greek politician Solon. There is not much external information about Plato's early life and most of what we know has come from his own writings. His father died when Plato was young and his mother was remarried to her uncle Pyrilampes. It is very likely that Plato knew Socrates from early childhood. Perictione's cousin Critias and her brother Charmides are known to have been friends with Socrates and they themselves were part of the oligarchic leadership of 404 BC. These connections should have led to a political career for Plato but at some stage he made a decision not to enter political life. The oligarchic leadership collapsed and democracy was restored and considering that Plato's family members had been part of the oligarchic terror must have meant that his position in Athenian society was under scrutiny. The condemning to death of Socrates by the democracy seems to have been the final political act of the state that forced Plato into exile at Megara. Plato is known to have taken refuge with Eucleides, founder of the Megarian school of philosophy and it is stated by later historians that during this period in his life he travelled extensively through Greece, Italy and Egypt. Whether these journeys took place is disputed but it is known that Plato did travel to Sicily where he met Dion, brother-in-law of the ruler of Syracuse, Dionysius I. The Socratic dialogue (Greek Σωκρατικὸς λόγος or Σωκρατικὸς διάλογος) is a literary prose genre, developed in Greece around 400 BC. The best known examples are the dialogues of Plato and the Socratic works of Xenophon. Typical of the genre are the dialogue form and the moral and philosophical issues that the characters discuss. The protagonist of each dialogue, both in Plato's and Xenophon's work, usually is Socrates who by means of a kind of interrogation tries to find out more about the other person's understanding of the moral issues. In the dialogues Plato presents Socrates as a simple man who confesses that he has little knowledge. 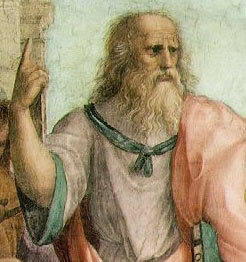 Plato uses the character of Socrates to state the aims of the inquiry at the outset of the dialogue. The outcome of the dialogue is that Socrates demonstrates that the other person's views are inconsistent. In this way Plato is using Socrates to show Plato's view of the way to real wisdom. One of his most famous statements in that regard is "The unexamined life is not worth living." This philosophical questioning is known as the Socratic method. In some dialogues Plato's main character is not Socrates but someone from outside of Athens. In Xenophon's 'Hiero' a certain Simonedes plays this role when Socrates is not the protagonist. The ordering of the dialogues is based roughly on the standard division into tetralogies. Authorship in many cases is uncertain, as we only have Plato's works as handed down through many generations of translations, forgeries, etc. Please consult the following legend. * It is generally agreed by scholars that Plato is not the author of this work. ** It is not generally agreed by scholars whether Plato is the author of this work. *** Consult chapter on this individual work for notes on authorship. All of the texts of Plato's Dialogues are available at the MIT Internet Classics Archive. This page was last edited on 11 September 2018, at 14:07.